I learned how to mix compost today, that we then used for potting on. It was fun! The compost we were making today was for general potting on and had to be made up of 3 parts of a coir + woodchips + controlled-release fertilizer mix to 1 part of a sand + gravel mix. ... our potting on compost is ready for the bench. 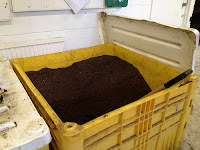 With the compost ready, we had to pot on a range of saplings from the small pots in which they were first sowed (seeds)/potted (cuttings) into medium-sized pots, where they can grow on and establish. The one in the picture is a rather elegant Pistacia species with green-bronze stems and leaves that also have a bronze underside. It is interesting to be able to observe plants this close when you pot them on, but potting is not an easy task to get right, especially when you are relative new to it (of course I have done it for my veggies, but here it is serious business). 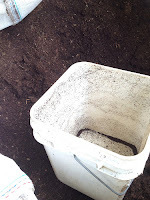 You have to press the compost well at the bottom, otherwise the level will go down when watering and the plant will sink, so there will be less room for the roots to grow into. Also, if you don't press it well around the plant, watering will make it unstable and it will get dislodged. 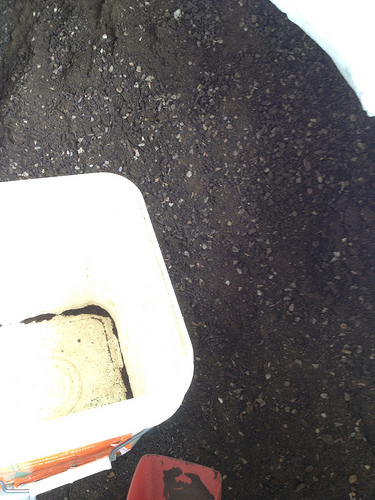 You also have to be careful that the level of the soil is at the root flare, so that you do not plant too deep. When you are finished, the plant is ready for a good soak. 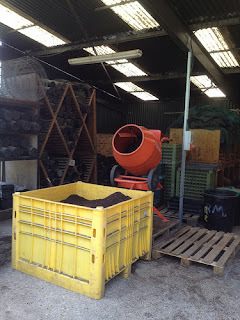 then they keep some redundant stock to account for any losses while the plants establish, but, at every round of potting on, only a selection of the best plants are kept. That is so that space, material and effort to keep them when they are already established is optimised, still allowing for some extra specimens at the end for the commissioning department to choose from. If the plants are of botanical interest, such as the ones that have been collected in the wild during expeditions, any spares available thanks to this redundancy system is shared with other gardens so that genetic material is preserved, should anything occur to the Kew specimens in the future. To make an example, let's say, for an easy plant to propagate, of which the commissioner needs 10 specimens at the end, they will take/sow anything in excess of 30 cuttings/seeds. Of the ones that take, they will keep a good amount, let's say 35 and pot them on in small pots. Then, at each of the successive rounds of potting on they will keep a few less, choosing the best ones: the most vigorous and healthy, with a good root system. 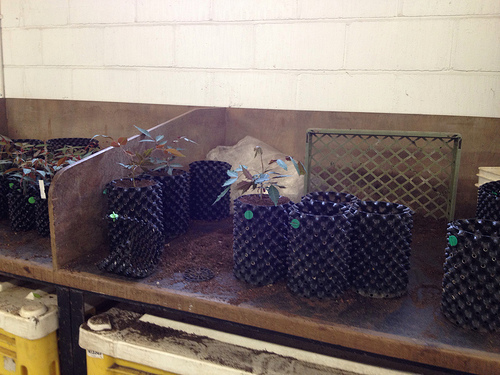 In our case, let's say there are 2 rounds of potting on: into mid-size pots and then on into large pots. 25 plants will be kept in the first round, and then 15 only will go into the large pots, to be weaned out of the nursery. I have always found it hard to get rid of even the weakest seedling, because I am always fascinated by the growing process, and that "miracle" that a plant emerging from a seed is, or a cutting that sends out roots and lives on... but you have to be ruthless if you want flourishing plants, the best genetic material, with the best chances of survival. That is, after all, what happens in nature.